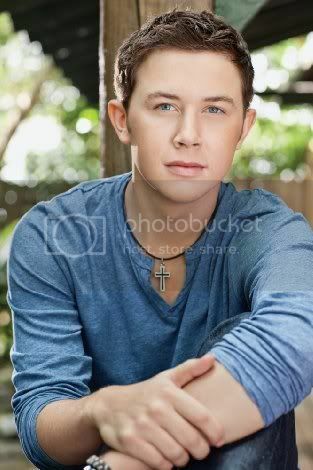 Things have been quiet on the Scotty McCreery front these days, not because he's not busy but because, I have been. When I read today that our Scotty is debuting a video on GAC's (Great American Country TV) chart at number 1 I had to change all that and come update you as soon as I heard. “Water Tower Town” is the third single off Scotty's debut record Clear As Day and with a strong showing on GAC looks like it will follow “I Love You This Big” and “The Trouble With Girls” and could be another Top 20 radio hit for Scotty as well. “Water Tower Town” was one of my favorites when I reviewed his album last year, I believe I called it “rockin'” and I know I loved the Southern colloquialisms and it made me nostalgic for my youth growing up down south. This is an ideal summer song and I know for a fact I'd have been blaring this tune from my sassy little, red '92 Geo Metro as a teen going to and from a football game, the lake, work or all three.